A team of researchers affiliated with several institutions in the U.S. and one in France has found a molecule that is effective against tuberculosis. In their paper published in the journal Science, the group identifies the molecule and describes how well it worked when tested in vitro and in a mouse model. Valerie Mizrahi and Digby Warner with the University of Cape Town have authored a Perspective piece on the study in the same journal issue. As Mizrahi and Warner note, tuberculosis kills more people than any other infectious agent—it kills more than 1.5 million people every year. 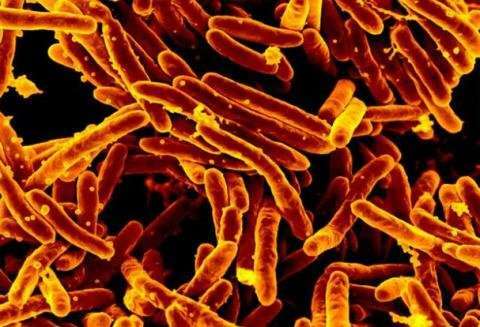 Tuberculosis is a bacterial infection caused by Mycobacterium tuberculosis (Mtb). This airborne pathogen tends to infect the lungs and is passed from person to person. Back in the 1950s, researchers developed drugs to treat the disease, but since that time, the bacteria has developed resistance—today, almost one-third of all new cases are caused by antimicrobial-resistant strains. Therefore, much effort has been put toward new ways to kill the bacteria. And as Mizrahi and Warner further note, such efforts tend to seek molecules that inhibit weak points in Mtb biological pathways, but which are not present in the host. In this new effort, the researchers report a molecule called 8918 that seems to fit the bill. They found that it inhibits the production of an enzyme called phosphopantetheinyl transferase (PptT) in Mtb, which is not present in humans. More specifically, they found that PptT was necessary for the biosynthesis of the mycobacterial structural and virulence lipids in Mtb. The researchers found that introducing 8918 to Mtb in a petri dish resulted in the death of Mtb. They also found that administering the molecule to Mtb mouse models killed some of the bacteria they carried without harming them. Before 8918 can be considered a candidate for clinical trials, scientists must overcome one obstacle—it has a short half-life, which results in rapid microsomal metabolism. This means it does not hang around long enough to kill very many Mtb before the body flushes it away.